On 25 January 1916, Thomas Johnson Westropp (1860-1922) delivered his Presidential Address to the Royal Society of Antiquaries of Ireland (RSAI). It was the apogee of a career spent in what he himself referred to as ‘the severe and less popular type of archaeology’. 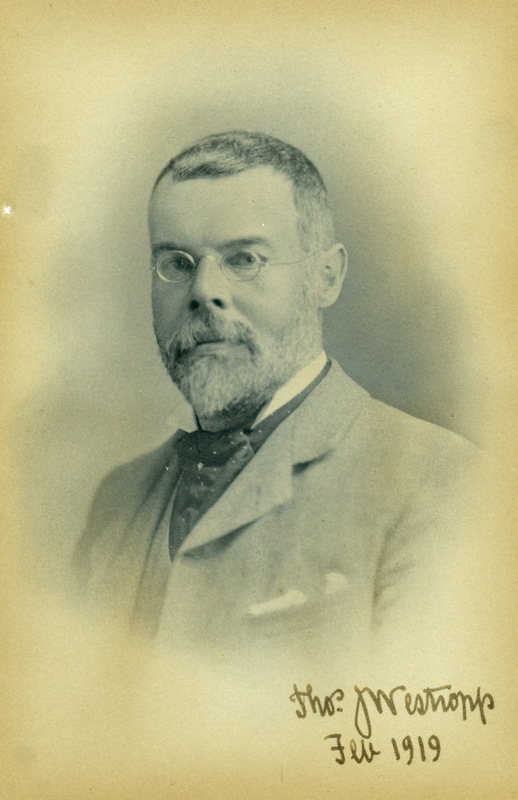 Born in 1860 to a wealthy Limerick landowning family, Westropp graduated from Trinity College, Dublin, as a civil engineer in 1885. His independent means ensured that he was able to devote himself on a full-time basis to antiquities. He published over 300 articles, and his comprehensive surveys of the prehistoric monuments and medieval buildings of Limerick and Clare stand amongst his finest achievements. His camera was a vital archaeological tool, and collections of his photographs have found their way into the National Museum, National Library, Trinity College, Royal Irish Academy and Irish Architectural Archive. The Archive holds twelve albums of photographs by Westropp. Each album bears an inscription inside its front cover indicating that they were sent by Westropp to his sister Mary Johnson O’Callaghan of Lismehan, Co. Clare, over the period 1898 to 1921. There are usually two photographs on each album page, and each photograph is individually identified in Westropp’s own hand. The subject matter is overwhelmingly antiquarian, with a strong geographical bias in favour of Clare and Limerick. 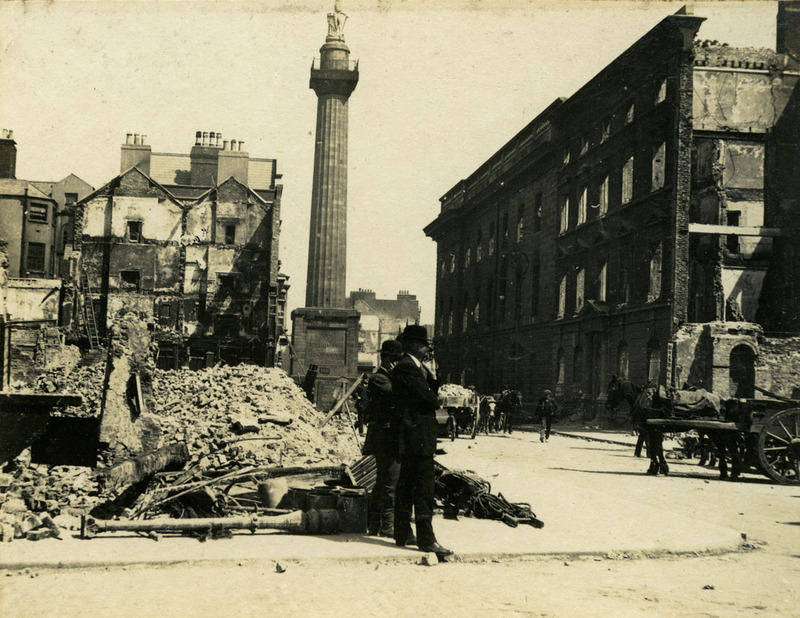 Three months after Westropp delivered his RSAI Presidential Address the Easter Rising erupted. The events of Easter Week 1916 clearly affected Westropp; he turned his camera away from the past to focus very much on the present. His position and reputation provided him with privileged access, and between May and June he took at least forty-four photographs of the damaged city. A set is in the National Library, a set in Trinity College, a set in the Royal Irish Academy, and in Volume 10 of the albums of antiquarian photographs held in the Irish Architectural Archive there are twenty-four photographs headed ‘Dublin after the Sinn Fein Rebellion’. Twenty-two are presented in this exhibition in large format prints derived from the original images in the albums. 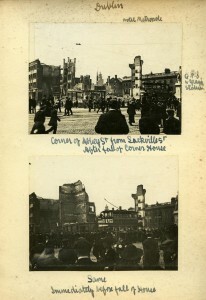 They are a vivid, still shocking, record of the destruction wrought to the centre of Dublin between 24 and 29 April 1916. One of the most impressively composed of all Westropp’s Dublin photographs, this image at first glance seems to give the distinct impression that nothing untoward has occurred in the centre of Dublin City. 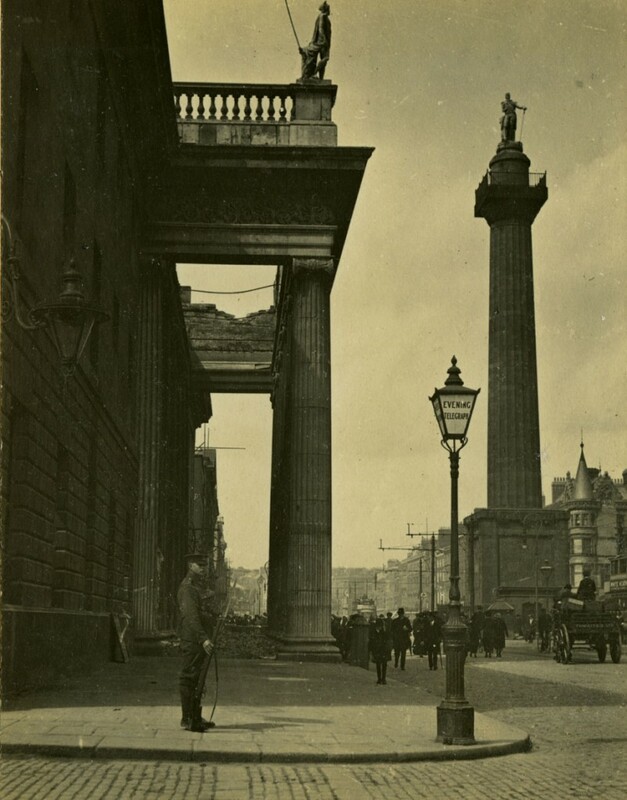 An alert soldier on sentry duty hints at the unusual circumstances, but the only sign of the devastation all around is the missing roof of the GPO portico. 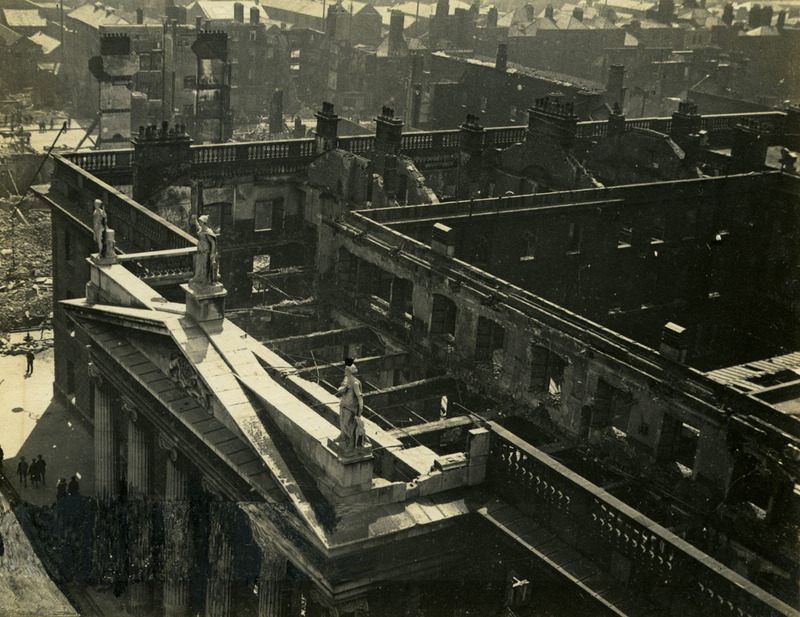 This bird’s-eye view, taken from the top of Nelson’s Pillar, shows just how complete the destruction of the GPO actually was, with only the portico and the outer and inner exterior walls still standing. Westropp noted in the margin beside this image that the ‘Republican Flagstaff’ was dangling from the corner of the building. A portion of the bottom left-hand section of the image has been retouched by Westropp. In this view of the north side of the General Post Office (GPO) from the junction of Henry Street and Moore Street, a hatted gentleman in the centre of the image echoes in his posture the stance of Nelson on his Pillar behind. With his companion, he observes the only traffic moving on the street, horses and carts removing rubble from the ruins. Westropp title: Liberty Hall, Head Quarters of “Citizen Army” After being shelled by gunboat “Helga”. Liberty Hall, the former Northumberland Hotel, had become the offices of No. 1 Branch of the Irish Transport and General Workers Union in March 1912. 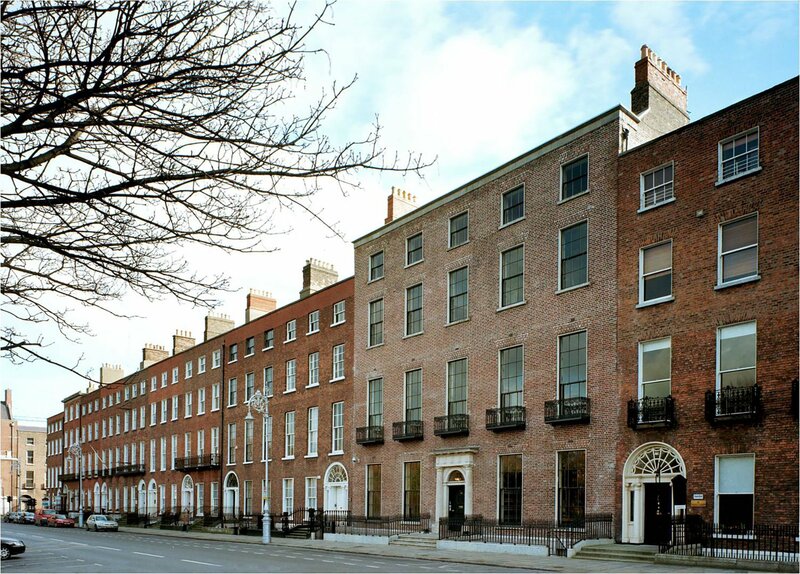 It was subsequently also the Headquarters of the Irish Citizen Army, and the assembly point of the GPO contingent of the Irish Volunteers on Easter Monday morning. Un-garrisoned, and occupied only by its caretaker, Liberty Hall was nonetheless shelled on the Wednesday of Easter Week (26 April). 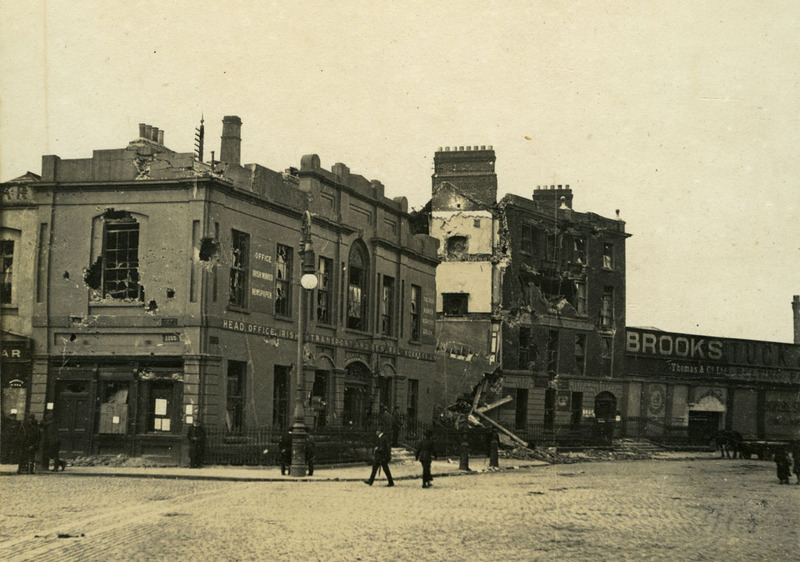 From Westropp’s images, it would appear that as much damage was caused to the neighbouring houses as to Liberty Hall itself. 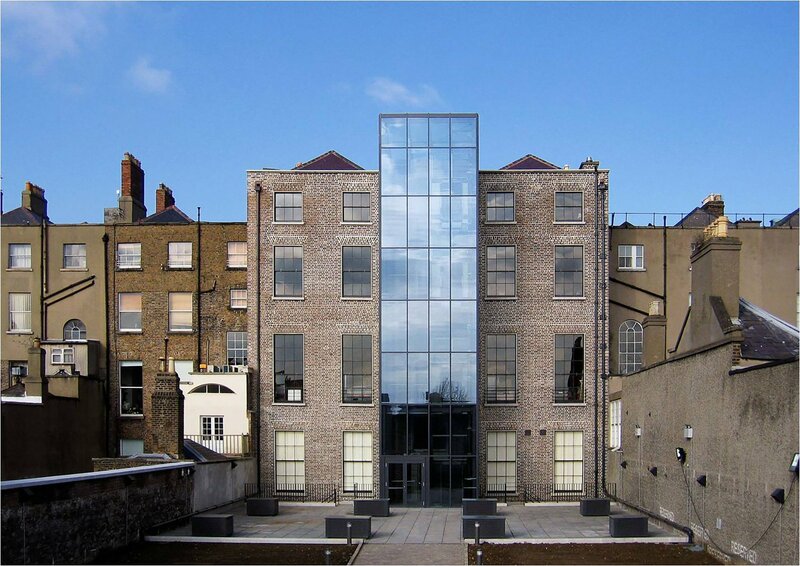 The exhibition runs in the Irish Architectural Archive’s Architecture Gallery from 4 Feb to 31 Aug 2016. 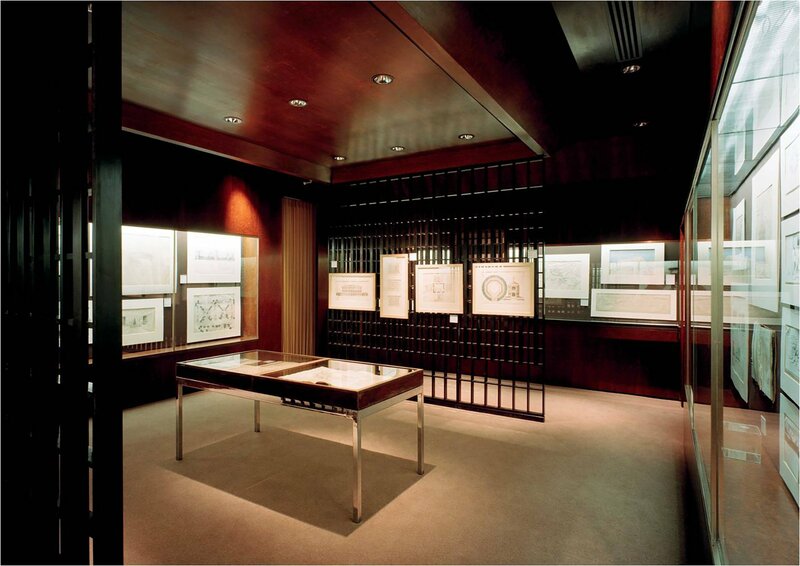 The Gallery is open to the public from 10 am to 5 pm, Tuesdays to Fridays.